Situated in Mile End, London across the road from Queen Mary, University of London, our student accommodation is conveniently located in Zone 2 for London universities with University of the Arts, London School of Economics and City University all within 20 minutes by public transport. 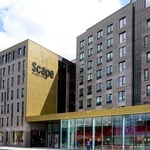 Scape offers everything you need to enhance your time at university while studying in London. Our friendly reception is staffed 24 hours a day, 365 days a year. Our team is always happy to help – whether it’s finding more about the building, what's around Mile End, or just for a friendly chat. 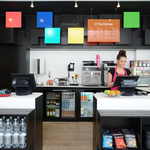 With secure key access, 24-hour security and CCTV, you'll always feel safe at Scape. You can study privately in your room or in our quiet study areas with high speed Wi-Fi throughout the building. 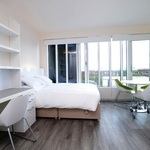 There is plenty of common space where you can meet other students living at Scape. 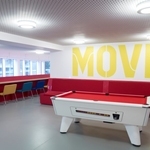 You can socialise in our first floor lounge with a TV and games tables, or you can cook with friends in our communal kitchen, which has dining tables, a big screen TV for film nights and comfy bean bags. Scape East has its own private gym with free membership for residents. The Gym is open every day and offers a range of cardio machines, free weights, Crossfit and stretching areas. Our social team of students help organise monthly events at Scape and across London. Some of our students write for our blog, where topics range from exams and revision tips to the best local markets in East London. Scape combines designer rooms and state-of-the-art facilities with excellent service and lively social community. Every student room has been designed by Ab Rogers Design using high end materials and built-in storage for maximum efficiency, so students can study, relax and hang out with friends. 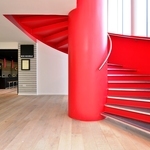 Colourful furniture, drawers and radiators accent each room, with a different colour theme on every floor which runs throughout the corridors and onto the post boxes in the lobby. 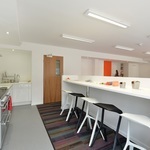 Scape Student Living - the ultimate student experience from Scape Student Living on Vimeo.